*Corresponding author. Tel. : +1 709 7496118; fax: +1 709 7229064. E-mail address: jahra.fatima@oceaniccorp.com (F. Jahra). Vegetation plays an important role in the physical, ecological, and hydraulic functions of streams, rivers and many other water bodies and can affect the transport of water, sediment and nutrients both within the channel and to or between the riparian zones. This research studied the momentum and passive contaminant transport mechanism in a vegetated channel with a floodplain (river bank). Three dimensional numerical simulation and physical experimentations were conducted for turbulent flow in the presence of model vegetation. 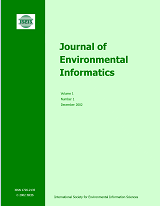 A non-linear k-ε model with a vegetation model for turbulent flow and an algebraic flux model proposed by Daly and Harlow (1970) (DH model) for contaminant transport were adopted. An in-house code developed by the authors was implemented for numerical simulations. Model vegetation zones were prepared in the channel to predict the mixing mechanism. The numerical results were compared with corresponding experimental observations. A good agreement between the simulated and experimental results was observed in terms of pollutant concentration.